How easy it is to hook up HID fog lights on Chevrolet Silverado with factory installed fog lights in the bumper? Not as easy as with aftermarket lights but totally possible. The stock factory housings are both small and shallow allowing the HID bulbs to get too close to the plastic lenses and causing them to melt or distort. Seems like using the 35 Watt HID's is just a bit much at times necessitating the need for installing a set of 25 Watt HID's to eliminate the possibilities of suffering an expensive melt down of the stock fog light lens. The Silverado uses these HID 5202 Fog Lights , (H16 or 9009), bulbs in the fog lights and the housing is plastic so you fit up to a 35 watt bulb and ballast in them but using anything more will melt them. Being one to error on the cautious side, we will be installing a set of 25 watt HID's just to help eliminate any future problems. We have these lights on order and will report back once they arrive. 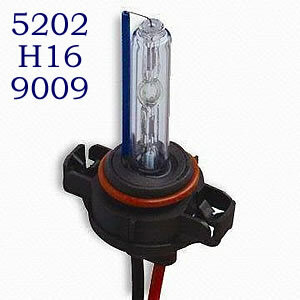 HID's give off a much brighter light then do the standard Halogen lights you are replacing. HID lighting is highly energy efficient producing approximately 90 lumens per watt compared to a quartz halogen lamp of approximately 25 lumens per watt based on 13.5 volts. If you're looking for replacement Chevrolet Silverado fog lights or custom HID fog lights, remember that the fogs are wired to only work in conjunction with the low beam headlights. Replacing the stock bulbs with brighter lights can be a problem for oncoming drivers. 2007 2008 2009 2010 2011 Chevy Silverado Xenon HID Conversion Kit Fog Lights & Driving Lamps for your new Chevrolet trucks. 5202, H16, 9009.